I made a dress in 48 hours! This is the Easy Kimono Dress by PatternRunway. I have made this pattern before and made it a very easy dress very difficult for myself. This time I followed all the instructions and it went together very quickly and easily – funny how that happens! 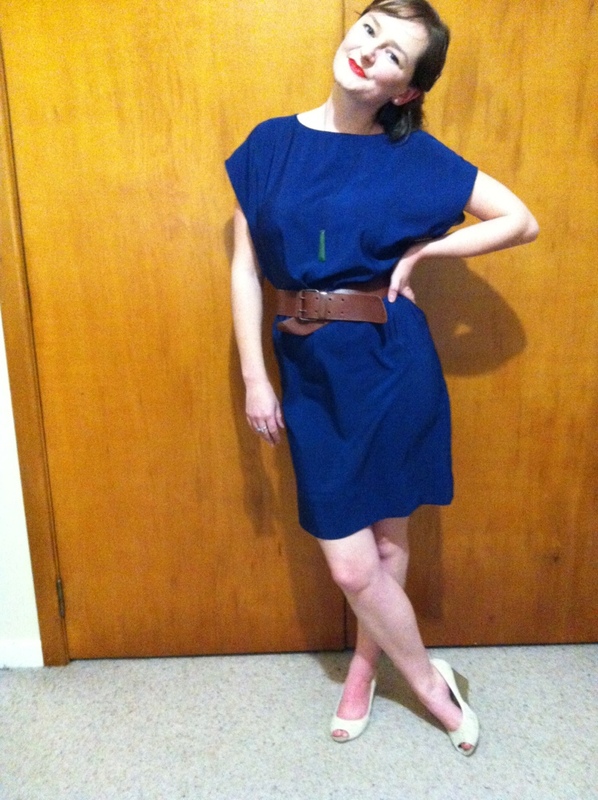 I made this dress out of a faille that I bought from Spotlight. I’m not often in Spotlight but I really wanted to get some flannel to make some Tofinos (yet to happen). I came across this fabric and thought it had a good drape : body ratio. It was $20/meter and I only needed one. Hello $20 dress! I made this dress in a small and made only one adjustment. I added 2 centimeters onto the edge of the skirt piece. Last time I made this dress it sat a bit tight across my hips and I prefer a lose fitting skirt look with this pattern. In order to do this I used a long stitch around the top of the skirt piece and gathered it in a touch so that it would match the width of the top. I then sewed and overlocked them like normal and put the elastic in. I thought about using a bias binding on the sleeves and neck instead of the facing pieces provided as I find facings to be quite fussy. In the end I went with the facings partly because I like the flared look of the sleeves and partly because I didn’t have any navy bias and it was raining so I didn’t want to go out – how slack is that? Wondering what that green thing is? It’s a Pounamu necklace. Pounamu is a precious stone in NZ, similar to Jade. 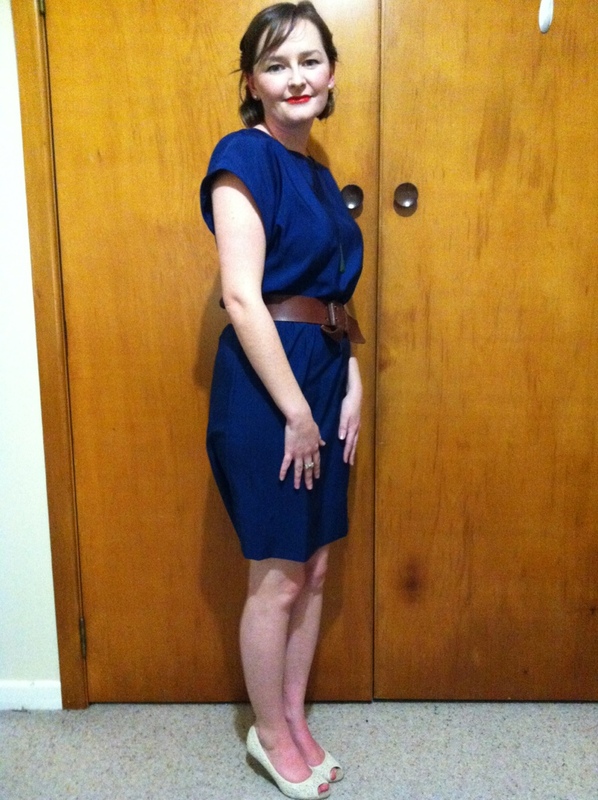 Have you sewn any PatternRunway dresses? Can you make me a recommendation? look at you … that’s lovely! I’ve been thinking about making this pattern for ages, and your version is great! It looks very flattering and easy to wear. I think I might download it now! I also spied the latest Pattern Runway designs, I Like the Stella top with layered sleeves. I think you should (but then I’m biased!) it is very comfortable and easy to wear to all sorts of events/ work/ outings! Love it! What a great color for you. Would be great for work and after work dinner & drinks with the girls, too 🙂 I’ll have to check out the pattern. I’ve thought about getting this pattern many times but just haven’t done it. The shape is pretty great on you, simple and chic. Loving navy on you! Very lovely dress, so simple and elegant. I have not sewn any Pattern Runway patterns, and I have to make a confession. Until I clicked on the link you provided, I thought that people were actually referring to the ProjectRunway patterns by Simplicity. Oooops! 🙂 Now, I can peruse through the site and check out the new (to me) patterns! Oh I adore easy dresses like that, and it looks great too! I seem to find myself going back to the few patterns that I like and make the same few dresses from them. Do you do the same too? Yes there are some patterns I have made several times and I had wanted to remake this for a while. I’ve always loved the shape. I just made a poor fabric choice first time around! Beautiful dress – looks great with that belt. That color looks so good on you! Very chic. Thanks Karen! Yes it sort of needs a belt otherwise it looks a bit frumpy haha. Nice choice of fabric for this dress. Yes definitely the coffee date dress. The coffee date dress is great isn’t it? (Though I think it would make a great evening dress too). I love this shape of dress! I wear this sort of thing and would happily get my hands on this pattern!! !